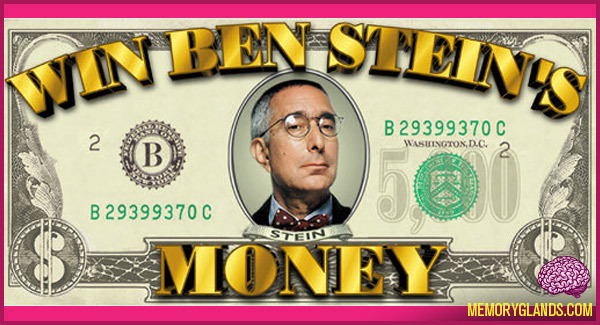 Win Ben Stein’s Money is an American television game show that ran from July 28, 1997 to January 31, 2003 on the Comedy Central cable network with episodes airing until May 8, 2003. It featured three contestants who competed in a general knowledge quiz contest to win the grand prize of $5,000 from the show’s host, Ben Stein. In the second half of the show, Stein participated as a “common contestant” in order to defend his money from being taken by his competitors. The show won five Daytime Emmy awards; Stein and Jimmy Kimmel, the show’s original co-host, shared the Outstanding Game Show Host award in 1999. As noted in a disclaimer during the closing credits, prize money won by contestants was actually paid from a prize budget furnished by the producers of the show. Any money left over in that budget at the end of a season was given to Stein. If the total amount paid out during a season exceeded that budget, the production company paid the excess, so Stein was never at any risk of losing money out-of-pocket. Stein’s co-host was Jimmy Kimmel for the first three years of the show’s run. Kimmel left in 2000 (though he did make occasional guest appearances afterward and even hosted College week episodes in 2001). Nancy Pimental replaced Kimmel and co-hosted the show through 2001. Kimmel’s cousin, Sal Iacono, who took over the role in 2002, was the show’s last co-host.